Georgie Howell and Caleb represented Littlehampton at the Swim England National Summer Meet, alongside Lewis Smart, Charlie Hodges and Calvin Fry, all representing their schools. Georgie’s excellent week started with a Silver medal in the 100 breast and a 3 second PB. The next day Georgie made the 200 IM final, finishing 4th, 2 seconds faster than her heat. An excellent 400 freestyle saw another PB, finishing 12th. Georgie topped off her week with another PB in her 100 back and then a massive 5 second B in her 50 fly to win Bronze! Brilliant! Caleb had a blast with several large PBs. 4 seconds on his 100 breast, 5 seconds in the 200 IM, 1 second on the 100 fly. A 5 second PB in his 200 free saw him into the final, where he knocked another second off! Fantastic! 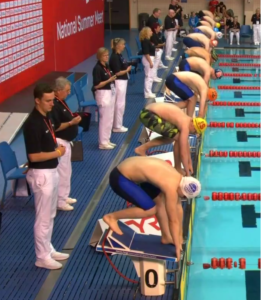 Swimming for Millfield School, Calvin made two finals, finishing 9th in the 200 IM and 8th in the 100 back finals. Both PBs! Charlie and Lewis both swam for Mount Kelly. Charlie finished 7th in the 50 back final and 6th in the 100 back final in a PB time of 1:01.35. Lewis stormed to Gold in both the 400 and 200 IMs in two very exciting races with large PBs of 4:44.25 and 2:12.45 respectively. What a superb week all five have had, well done all of you! Caleb is off to the Special Olympics this week, along with Marcus Harvey. 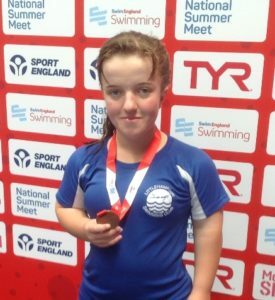 Then Georgie is swimming for England South in the Sainsbury’s School Games in a couple of weeks. Good luck guys! Next: Next post: Emily is going to the Biathle World Championships!